Port Colborne, ON - Recycling rates for single-use batteries have climbed steadily since Stewardship Ontario introduced the Battery Incentive Program in 2011. Last year the Province recycled 49% of the batteries available, tipping the scale at 3,226 metric tonnes. In fact, Ontario recycles more single-use batteries than any other province or state in North America and even outperforms many European programs that have been recycling these chemistries for two decades. The Province has setup thousands of public recycling points at municipal offices and stores in most communities. In addition to that, 62 municipalities provide bi-annual curbside battery collections that piggy-back on the blue box program. 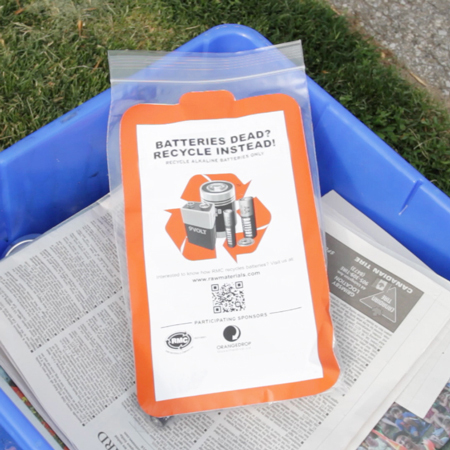 The curbside program has tapped into a new stream of batteries that were once destined for landfill. “Prior to the curbside battery program, Durham Region recycled approximately 25 metric tonnes (MT) a year from Waste Management facilities where residents can drop batteries off free of charge. Last year the Region recycled 50 MT, of which 33 MT were recycled at the curb,” said Stephen Laird at the Region of Durham. In Dufferin County, curbside battery recycling is having a positive impact on recycling at public drop-off points and at the hazardous waste depot. In 2016, the County of Dufferin reached a new milestone, recycling 5500 kg at the curb. This November, many Ontario communities will provide a fall collection to coincide with daylight savings, when fire departments remind homeowners to change the batteries in smoke alarms. The collection period and setout instructions are unique in each community, so it’s best to visit a municipal website for specific details. Basically, old single-use batteries are placed into a properly labeled bag and setout with the recycling on a week that’s advertised by the municipality. Once collected, the single-use batteries are sent to Raw Materials Company in Port Colborne Ontario to be sorted and processed to recover the reusable materials inside. The recovered materials are reused in the manufacture of new products, displacing the need to mine and refine raw materials from ore. A major cause of green-house-gas emissions. Another hidden benefit of curbside battery collection is the reduction in green-house-gas emissions. “If you look at a community that recycles 15 MT during a weeklong collection, you’re saving 20,000 individual trips to recycling points,” said Graper. If curbside collection is not offered in your community, you can visit rawmaterials.com to find a recycling point in your neighbourhood.